Sonya Renae Hodges, a lifelong resident of Columbia, South Carolina, has devoted the majority of her adult life to Public Service. At the age of eight Sonya began to write memorials and Family History. Oral history lessons, spellings and dictations were taught by her mother, Aubrey Thompson Hodges. Little did Sonya know that in later years her writing skills, research skills, her personality and wisdom would earn her respect from persons of all ethnic groups and from all walks of life to include: U.S. Generals, millionaires, and foreign U.S. Allied Diplomats. Educated in the public/private schools of Richland County, South Carolina, Sonya earned a B.A. degree in Public Affairs from Columbia College and has received Continuing Education credits from Johns Hopkins Bloomberg School of Public Health, Baltimore, Maryland, with an emphasis on Disaster Preparedness/Disaster Recovery and Food Safety. In a leadership capacity Sonya has served as the Chair of Volunteers with the American Red Cross, Armed Forces Services, Fort Jackson, South Carolina, a position paid via the State of Maryland. Founder & President of the 371ST Historical Society, World War I. 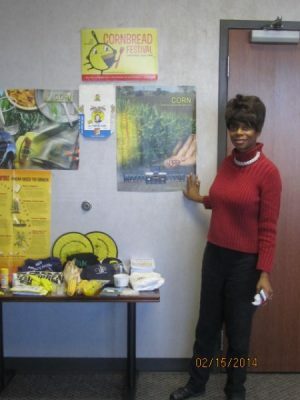 Founder: Cornbread Jubilee, (2011), an annual event that is held in honor of the corn crop, agriculture, farming and World War I. Co-Founder of the Veterans Formation, (1993), Columbia, South Carolina. Sole Restorer/Curator of Childs Cemetery, Columbia, South Carolina. Sonya is the mother of ten children and seven grandchildren. In 1997 Sonya was nominated to have her biography included in Who’s Who Among Women in America. Sonya has also authored the following books: Grantham, Thompson, Wells and Williams Family Reunion (2008). Reflections of the Original FrogTown Community (2010). Childs Cemetery Volume (2013). Sonya is a member of the Following Organizations: American Legion Post #215; Columbia Council of Neighborhoods; 82ND Airborne Historical Society, Fort Bragg, North Carolina; National Corn Growers Association; Advocate-Kansas Wheat Commission; Manhattan, Kansas; South Carolina Genealogical Society,(Columbia Chapter); 369th Historical Society, New York, New York; South Carolina Agriculture Council; South Carolina Society; “Together We Can Read” Vietnam Veterans Of America-(Associate-Member).